Developers may argue the virtues of their preferred language over another, but the truth is that the best programming language depends on its intended application. With so many options to choose from, each with their own pros and cons, senior editor Stephen Cass discussed the top 10 languages for 2015 in a recent article for IEEE Spectrum. The Top 10 ranking was calculated with help from computational journalist Nick Diakopoulos. The system was based on weighting and the combination of 12 metrics from 10 data sources, including the IEEE Xplore digital library, GitHub, and CareerBuilder, to determine the popularity of languages from an initial list of 48. 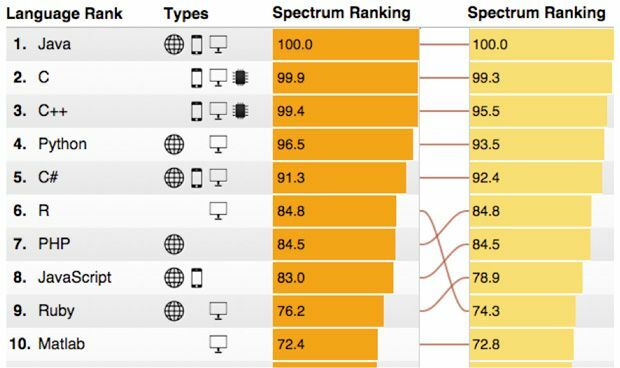 While the top 5 remain unchanged, C has moved within touching distance of Java, and statistical programming language R has jumped from ninth place to sixth. This is indicative of the growing importance assigned to Big Data. After comments made about last year’s ranking, ASP.NET was removed from the list as it is a framework and not a language. However, Apple’s new language Swift has already made the rankings, and Nvidia’s CUDA made an appearance as well, adding to a total of 7 new languages that appear on the list for the first time. The creators also built an interactive web app that can be adjusted to lend more importance to languages depending on your intentions. Filters can also be applied to refine results, and access to the web app costs US$0.99.